um, white guy, don't forget the white part! 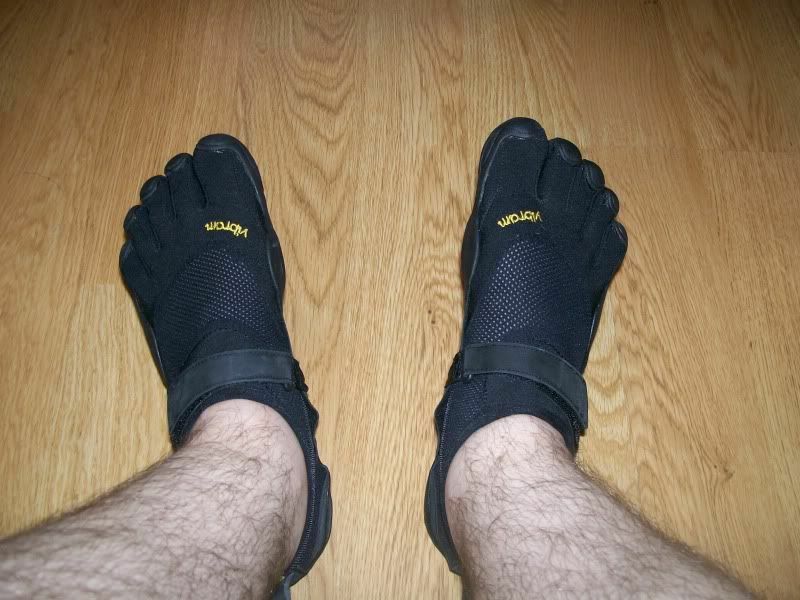 I love jika tabi shoes (I used to call them devil-hoof shoes), Vibram five-fingers and crocs (I can stick an arch supporter in them). And my view is if you don't like them don't look lol. I got a pair of Nike Rifts that are cool and I always get questions about them (super comfortable) and my friends have come to expect me wearing weird or interesting looking shoes. Anyway, my aim is to not have Fred Flintstone feet. The wrong shoes can cause all sorts of problems down the road not just corns, lol. Then you can you relate, no? careful- the number of active women members outnumber the number of active men members. just want you to be aware of that. now- anything else you want to say about women? hmmm? and no, i can not relate to him(her?) this person who at first claimed to be ojibwe, changed the story and is now cree. says he's a guy but mentioned dating a navajo dude and having a thing for rodney grant? so how can i relate to someone, how can i know who someone is if they don't know who they are? I checked with co-workers from our physical training dept, they all like the Vibes 5 toes....so now I'll have to get some. We do some extreme hiking in all types of terrain, being on slopes with standard boots is a real workout, and dangerous. I don't think the upper bosses will let us wear the 5-toes as part of the uniform. So you ARE sensitive.......? What's with the slams against WW? If you want him out of this forum, there must be formal ways to do so. WW started a thread about unusual boots, and most of us found it entertaining, even if off-topic. In a world where people have systematically be told to deny their Native heritage, and many lost their connections, here we see a guy hoping to regain his, however tenuous it may be. And he has opened up, with the risk, things about himself.....but not to be ridiculed. no where in any of my posts have i mentioned that i am sensitive. you mentioned it, not i. also no where in any of my posts have i said i want you out of this forum. not to winktewolf or anyone else. again those are your words, not mine. i will say, and you can quote me. winktewolf doesn't need me to make a fool of winktewolf, winktewolf has done a fine job on winktewolf's own(i'm ojibwe, no wait, i'm cree!). as far as opening up things about himself, everything he has 'opened up' about himself is fair game for ridicule. in a nutshell- a white guy who claims to be ndn with a thing for very funny looking footwear and has a crush on rodney grant, which is freaking hilarious if you ask me. and back to addressing the beginning of your post- what you call 'slamming' i call good clean fun. i do use the the word 'slamming' in my vocabulary- i use it in a different context however. when i use the word slamming, it's like saying awesome. i.e. hey g&b did you go to the prince concert last night? yes i did, it was slamming! ...if i can find a smilie that depicts a white guy that married an ndn woman and now has the authority to come to an ndn site and put an ndn in her place. or how about a smile that is choking on a piece of montana banana jerky. even better! My way of life is to defend peeps in trouble, and I am an Equal Opportunity defender. well the troubled peep is a liar and must die muhahahahaha!!! i can't be labeled sensitive and not live up to it. as for being nosy- not even close. stocking up on ammo is not the same as being nosy. however i am guilty of a throwing a hard right hook at someone trying to slapbox with me. i think it was you who stuck your nose where it didn't belong. and i reacted appropriately given the nature of the conversation. Back to jika-tabi, does anyone else wear them? I repeat what I said (somewhere) before - they look like you're wearing someone else's feet! Although certainly not to my taste - I do need some shoes that are good and "grippy." As some people here know, I am very, very fond of Cambodia. I love exploring the Angkor Wat temples. The only problem being the stairs were built for tiny Cambodian feet from 1000 years ago. So, I've never felt real steady climbing the stairs with my (comparatively) large feet, and I think something a little grippier than tennis shoes might be just the ticket. So how are the Vibram 5-fingers in the "grippiness" department? Are those your legs in the pic? Dang, I thought I'd stumbled into the Bigfoot thread!! !